Would the seams hold up? — Some of the seams were iffy. Did I fix enough of them? Were the fabrics going to bleed? — I have no idea if I washed the fabrics when I bought them I usually did back then, but the piece I had for the binding didn’t look like it was washed. So, to the laundry mat I went to use a very large (6 loads!) front loading washer. 3 Carbona Color Grabbers, a bit of Synthrapol and liquid All Free Clear in warm water. Fingers crossed. No pink! Even the pink I spotted before washing it (Was it Diet Dr Pepper Cherry?) came out. I thought for a moment it was the NAVY on a couple of spots, but after the quilt came out of the dryer I couldn’t find them. The quilt is back on the bed. A full picture would not show the quilting or the crinkling (not as much as I had hoped), so the picture above shows the quilting. Oh, I haven’t found any seams which ripped out either. The rest of the quilt story can be seen HERE. More accurately, what is on my bed? 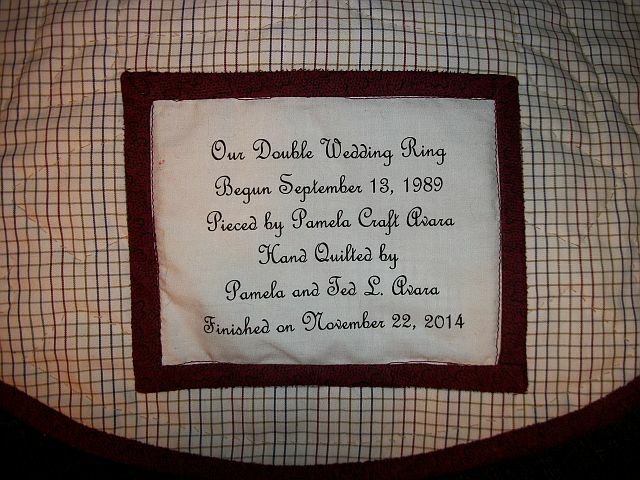 A long, long time ago, in a land far away, a young wife and seamstress wanted to make a Double Wedding Ring quilt for her and her husband’s 5th wedding anniversary. 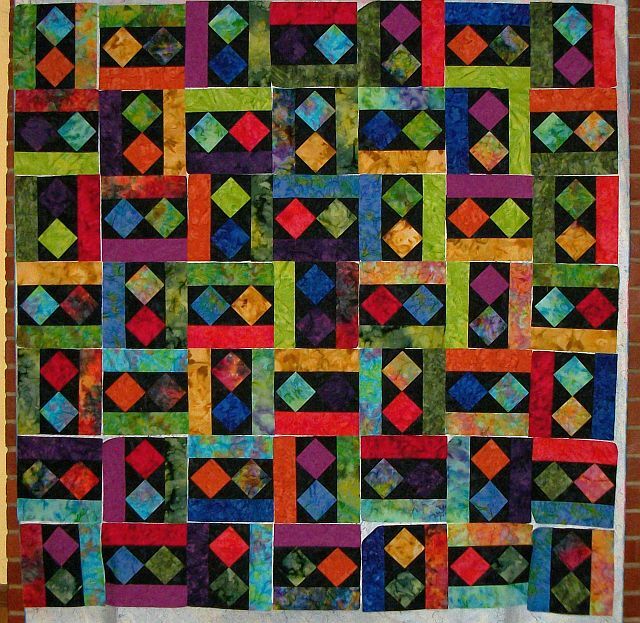 She went to the local quilt shop in Montgomery, Alabama and signed up for the class and purchased the fabric. The date was September 13, 1989. The quilt shop ladies did their best to talk this young woman out of making this quilt as it would be only her second quilt, the first one a simple applique quilt made 5 or 6 years earlier in high school. But, she was not to be denied. 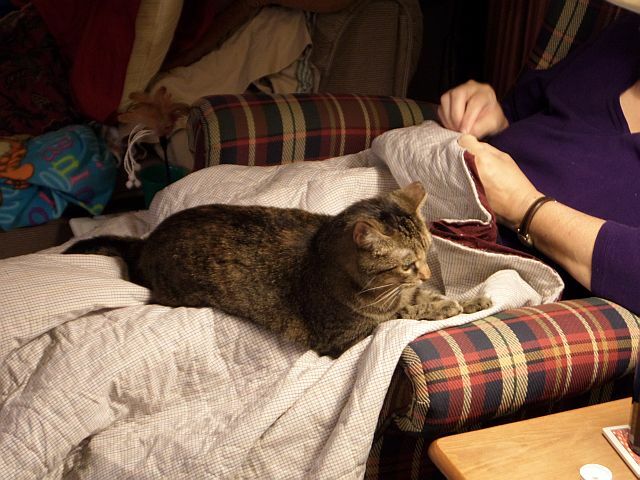 After all, she had over a year to get the quilt done. Material was purchased. 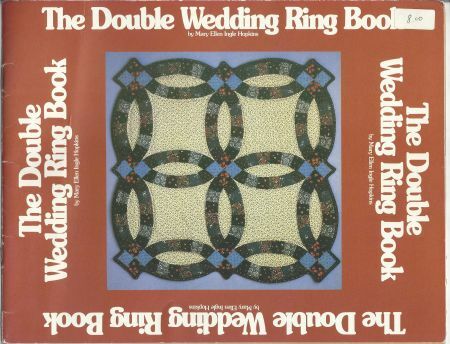 The quilt pattern for the class was Mary Ellen Ingle Hopkins’ book The Double Wedding Ring Book. 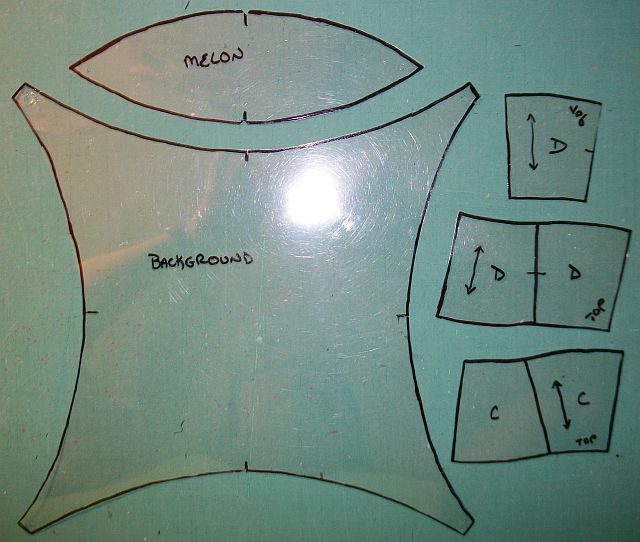 In class, she carefully traced off the templates onto clear plastic, drew around them onto the fabric and cut the fabric with scissors. 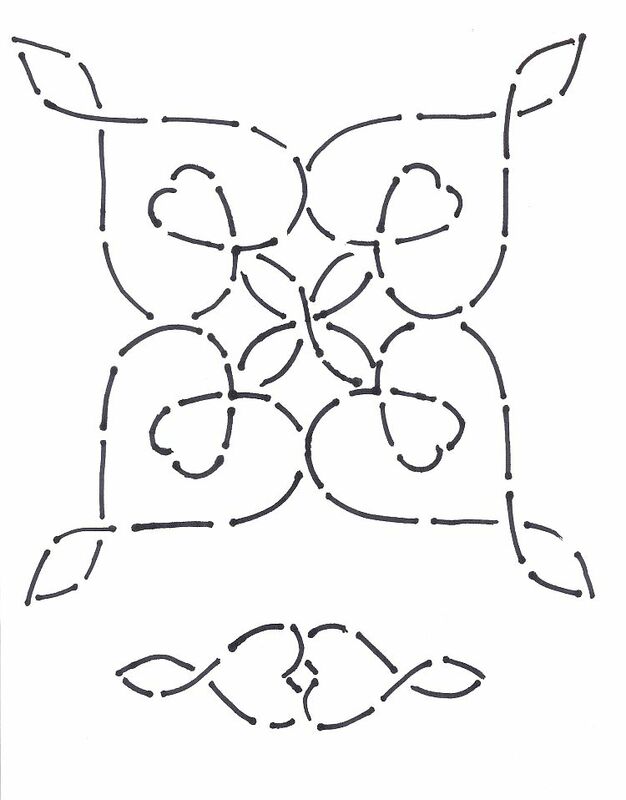 This was after all 1989 and shaped templates to use with a rotary cutter and mat were not available for this pattern. Over the course of the class, several rings were sewn together, a whole row or two were assembled, and then the young woman was on her own. More rings were made, but then a few months later the entire project was gathered up and put away so she could focus on her pending discharge from the military and move to the Kansas City area. 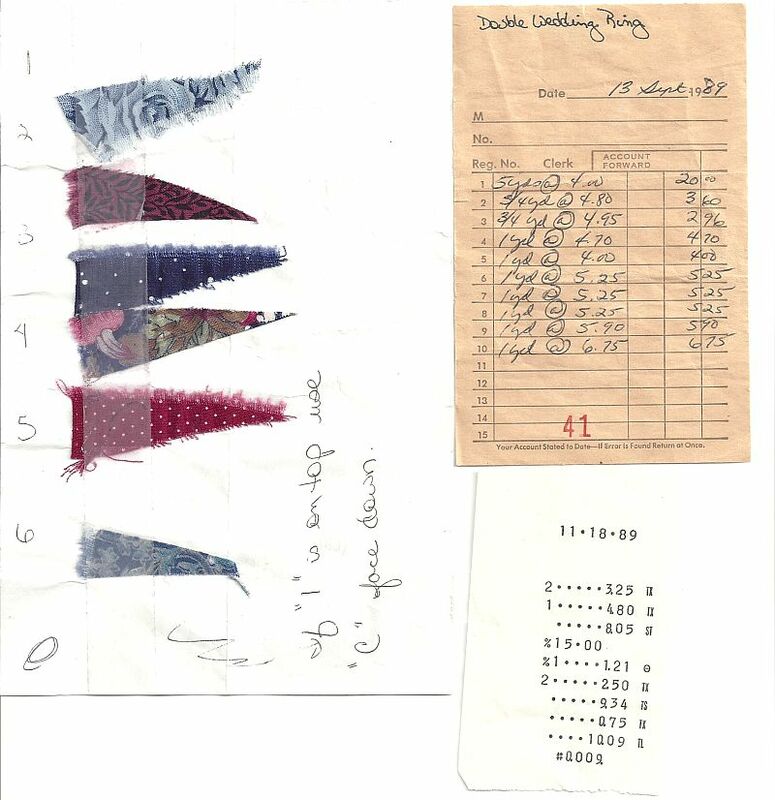 It is a lost memory on whether or not the quilt was worked on during the next year, but she did make a few simple quilts as “model garments” for the fabric store she worked at during the evenings. After a year in Kansas City, the couple moved to Texas where they lived for the next 7 years and three moves. 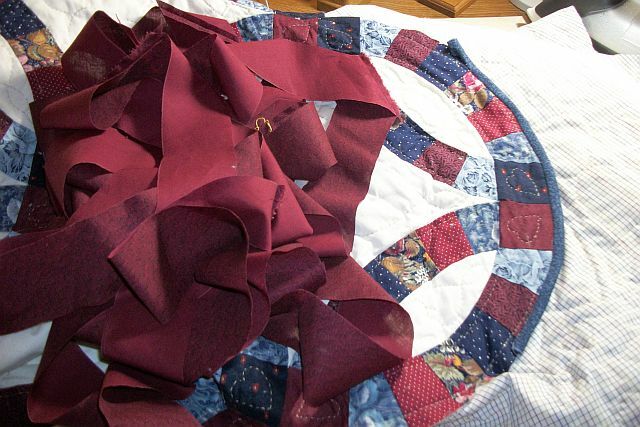 During this time, the quilt was pulled out periodically to be worked on with the revised goal of the 10 anniversary (1995). 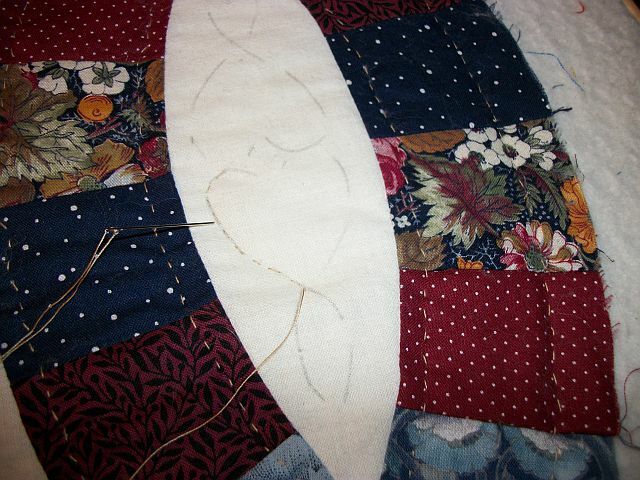 During this time the quilt never became the sole focus, so although progress was made, it was never completed. In 1999 the couple moved back to the Kansas City area. A new goal was set. Get the quilt done for their 20th anniversary. 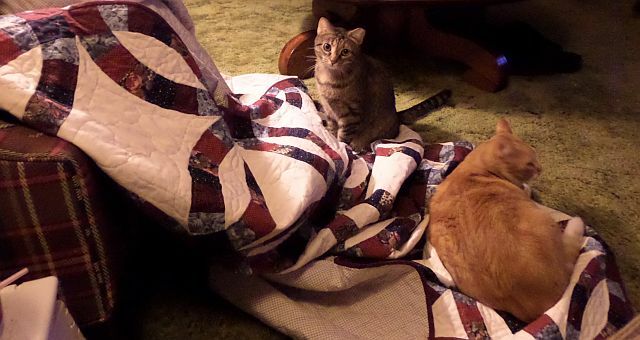 The quilt was pulled out periodically and an effort was made to work on it, but now she had a serious case of quilt pox and had new projects to start. Their 20th anniversary came and went. The 25th anniversary was the new goal. The quilt went to a couple of quilt retreats. A hand quilting class was taken in preparation of finishing the quilt. This was 2005 so there was still time to hit that 25 year mark. But now the woman was a more experienced quilter and she figured out why she was having so much trouble. It was those plastic templates that were being drawn around and cutting the fabric with scissors. If the cutting is not accurate, there is no way to make an accurate 1/4″ seam. 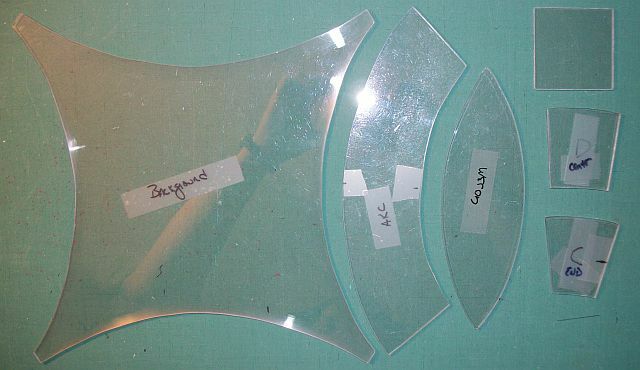 In 2009 she had a friend’s husband make acrylic templates from the original pattern so a rotary cutter could be used. It was amazing what a difference it made. Accurate cutting resulted in accurate piecing. But what about the earlier piecing. Some of it had seams that would rip out if it was looked at hard. The decision was made to fix those spots which absolutely had to be fixed and leave the rest. 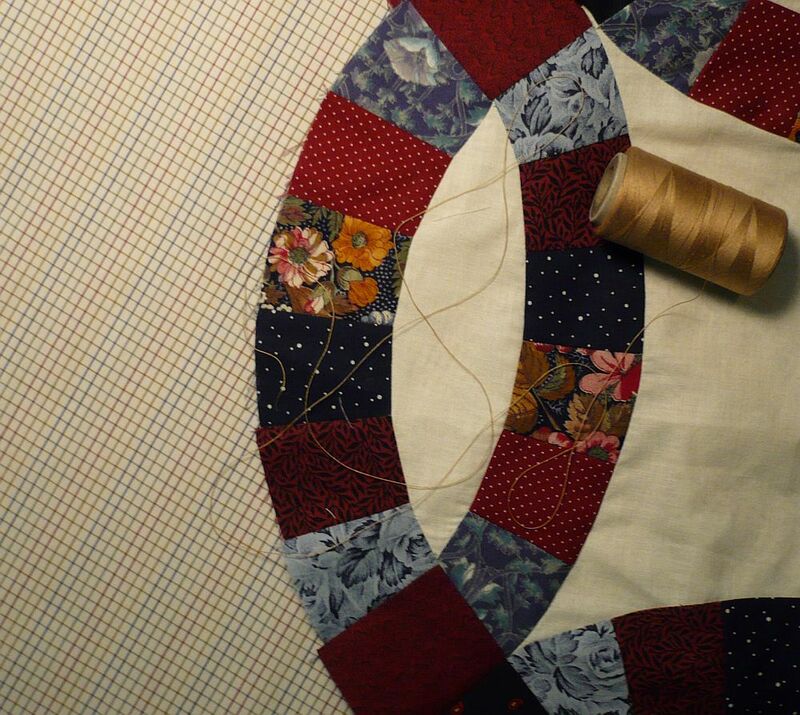 It would show how the quilter’s skill had grown over the years. 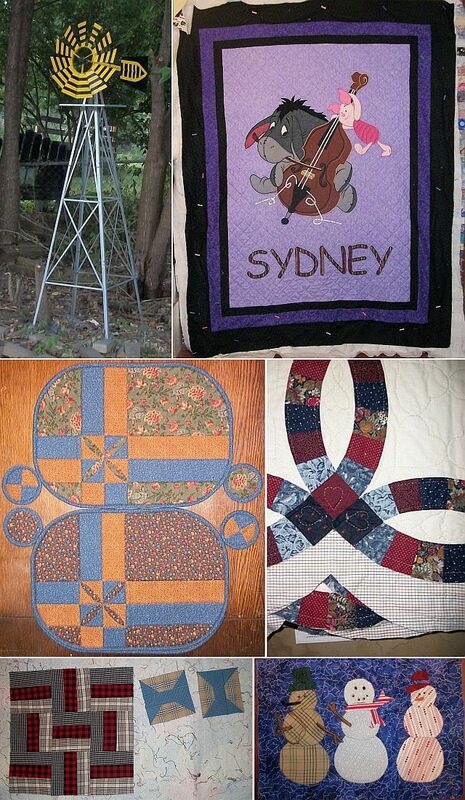 The quilt wasn’t ready for her 25th anniversary – but the top was nearly finished. The last seam was put in the top on January 5th, 2010. Now that the top was finished, a backing had to be found. The backing was found in the stash. A shirting fabric picked up on a retreat with plans to use it on quilts made from recycled shirts. A khaki thread was chosen. Quilters Dream Cotton Request was used for the batting. 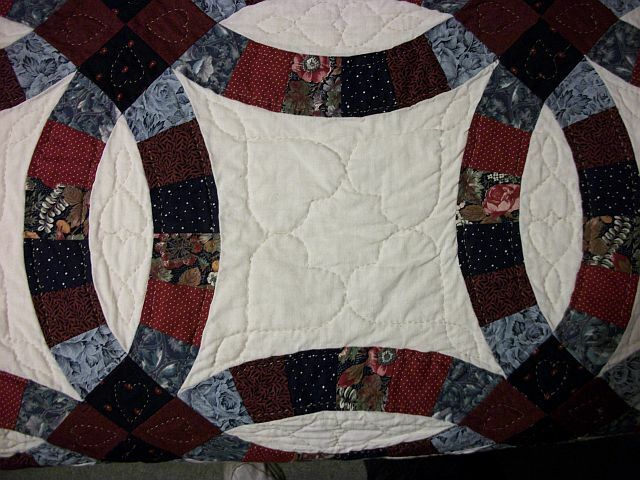 This Gloria Hartley stencil, purchased when the quilt was started and slightly modified would be the quilting design. 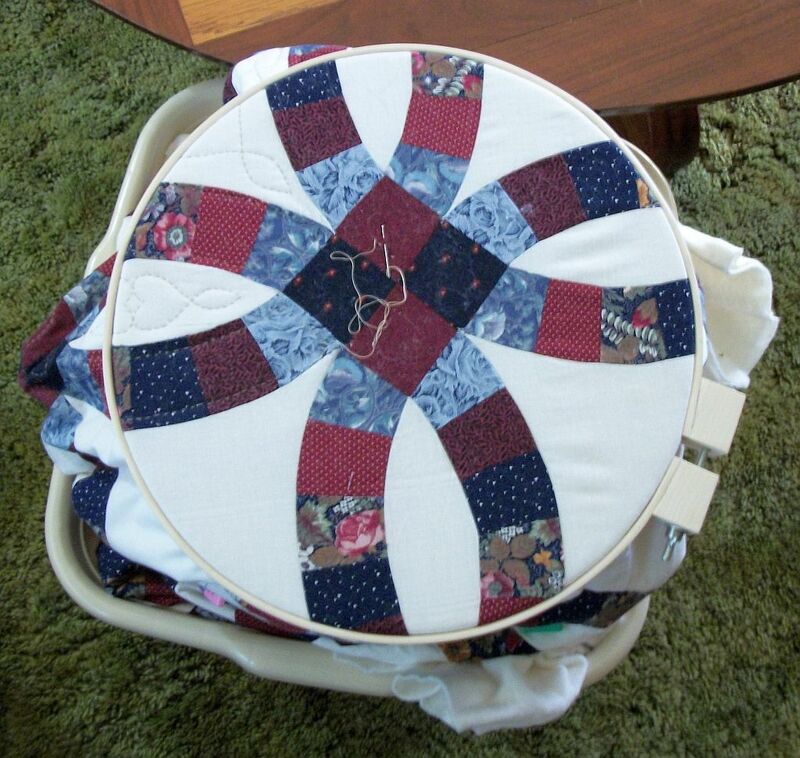 The quilt was first loaded into her Q-Snap frame. The couple’s cat Seven approved of this. 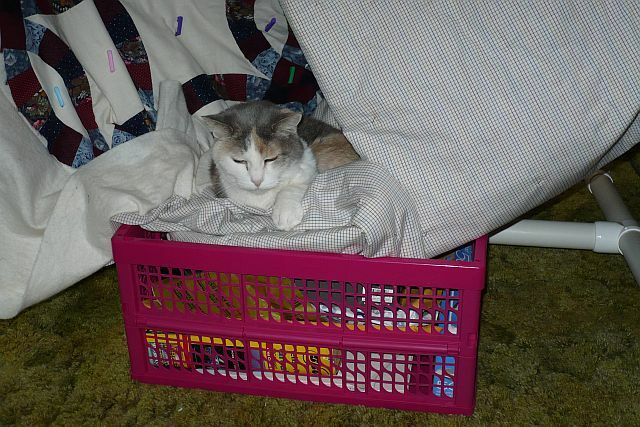 Later she switched to a lap frame stuffed into a laundry basket which took up less space. The woman quilted on the quilt on and off for the next 4-1/2 years. Well, 3-1/2 years. There was a year where it sat in her living room untouched. Just before the last stitches were put in, she had her husband do a few stitches. 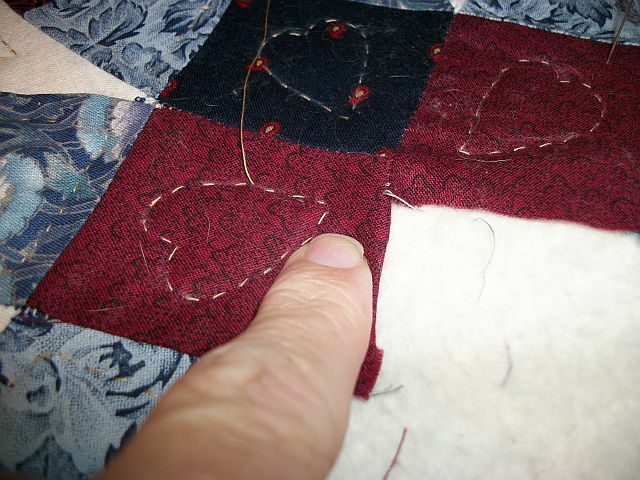 The last quilting stitch was made on July 10, 2014. Now it had to be bound. Most of the time the quilter machine stitched her binding both onto the quilt and then down, stitching in the ditch. 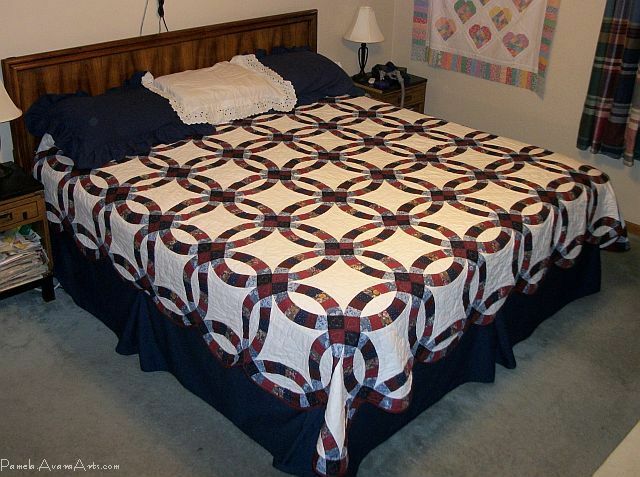 But given the curves of this quilt, there was some questions as to if it would be possible. Not to mention she had to make bias binding something she seldom did. So there was a delay. 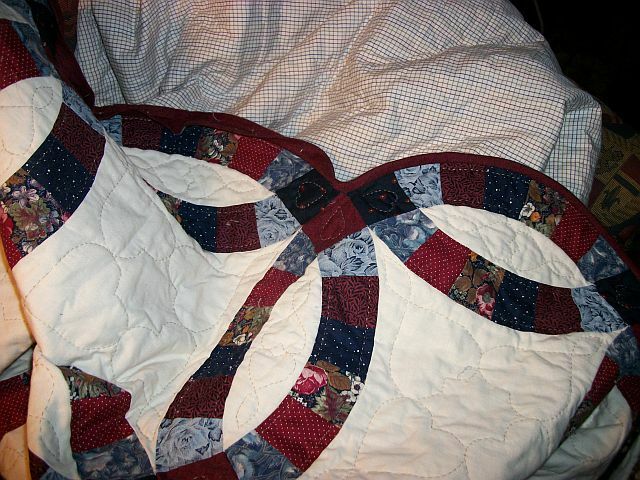 The binding was finally attached to the quilt on September 3, 2014. She decided to hand stitch the binding down. 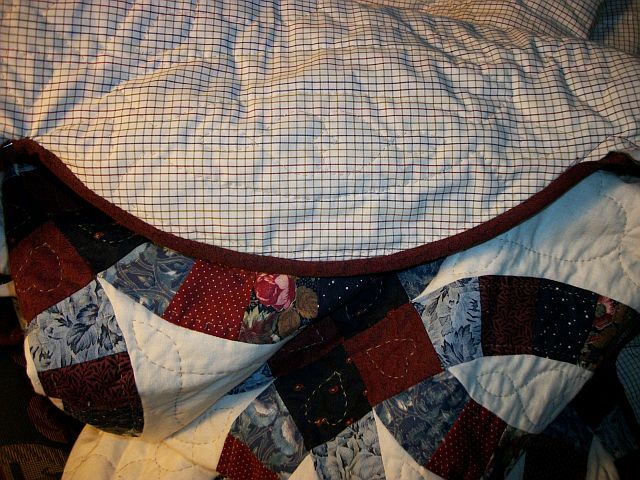 There are 30 rings along the edge of the quilt and could easily stitch one ring an evening. 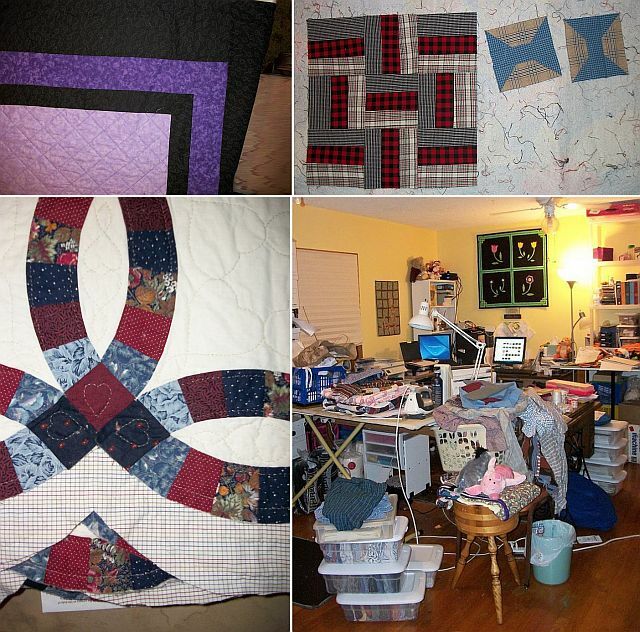 But there were other quilts to work on and new help to train. Butterscotch & Gracie joined the family toward the end of September and became the new Quality Control Cats. The final binding stitches were put in the quilt on November 22nd and the label was made and attached to the quilt. The next day, before washing, it was placed on the bed for a photoshoot. She still needs to wash it to get the marking and 25 years of accumulated dirt out of it, but it’s finished and in time for their 29th wedding anniversary on November 29, 2014. This quilt has been on so many UFO Challenge lists I’ve lost count. I’m linking up to Patchwork Times for Design Wall Monday, and when the 4th quarter 2014 Finish Along opens I’ll link up there as well as the DWR is on the 4th quarter list. I feel like I’ve fallen off the face of the earth. I haven’t, it’s just that “Life Happens”. I tend to keep everything (especially my quilting) going through crises real or imagined and then collapse when it’s all over. The past couple of months have been a whirlwind and it has caught up with me. Two new cats, two trips, in between DH in the hospital for 3 days (thank goodness(?!) it was during my vacation) with a cat bite and mi$cellaneou$ car/home/yard maintenance that had to be done NOW. So, I’m slowly getting my act together. The living room got a once over after watching a video of the cats jumping at a feather toy. I’m sitting down and working on the DWR – I’ve got about 5-1/2 rings left to bind, then I’ll add a label, photograph the quilt, wash it and photograph it again. (I’m terrified of the reds bleeding, but I really need to clean it before we sleep under it on a regular basis). Gracie was helping out a couple of nights ago. Last night Butterscotch was keeping an eye on me. 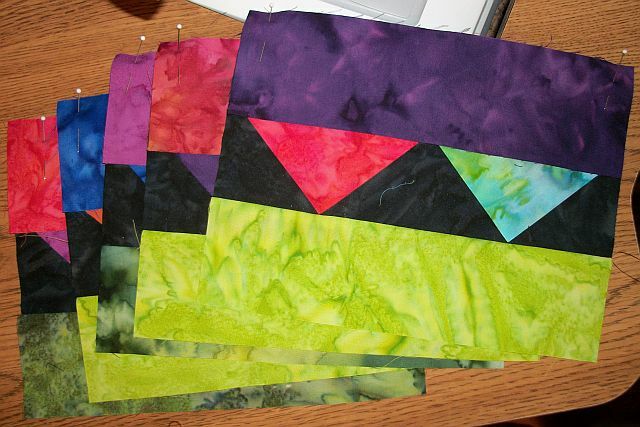 Earlier this week I’ve finished a few more of the batik blocks – I had pinned the strips to the center before the last trip so this required no brain. There are 14 more blocks to finish. We aren’t going to talk about the Stars or the Alphabet BOM until after Thanksgiving. In the meantime, I really need to do a bit of housekeeping. It’s so far behind it’s beginning to bother me. Two stars are from Monday, the blue one is from yesterday. 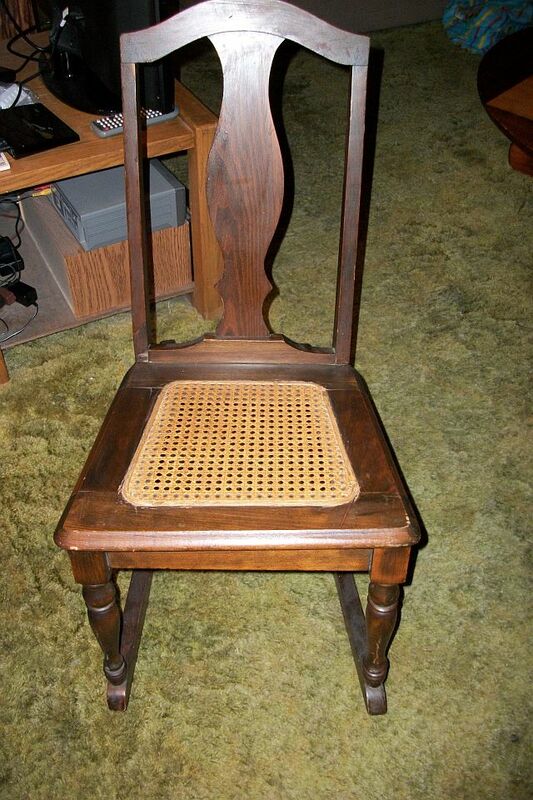 I’m partway through another star, but got distracted by going and getting this sewing rocker. Well there was also the distraction of thinking I had to replace a zipper in a formal dress by Saturday. After getting the young lady to try on the borrowed dress, it became apparent that the zipper was the least of the problems and another dress is needed. Additionally, I ripped out the stitching where I attempted to machine stitch the binding down on the DWR. It still hasn’t made it into the sewing machine. Maybe tonight. At the moment, my design wall is empty. I’ve started sewing strips to the double square in a rectangle pieces. Haven’t gotten very far. On the other hand, I have the binding on 7-1/2 arcs stitched down. It’s beginning to look like a finished quilt. Only 22-1/2 arcs of binding to go. 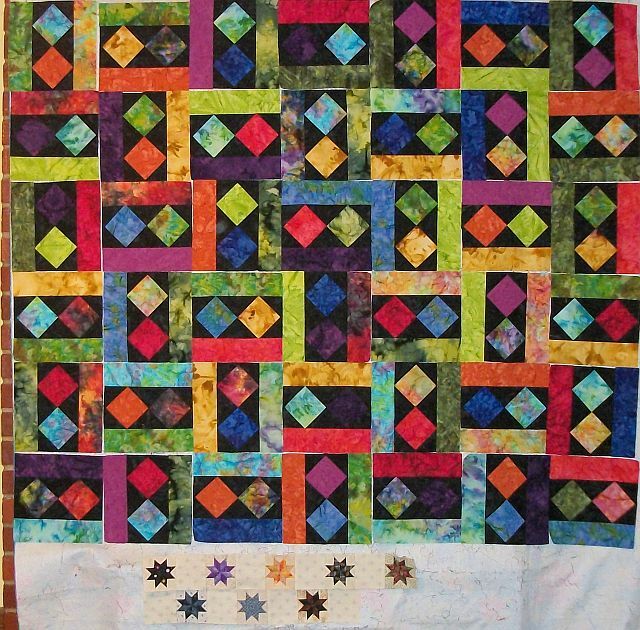 See what others are working on by visiting the links over at Patchwork Times. Today I attached the binding to the DWR and started sewing it down. Most of my bindings are stitched down on the machine. In fact 5 or 6 rings are stitched down by machine, but I’ve decided that I’m going to stitch this down by hand. 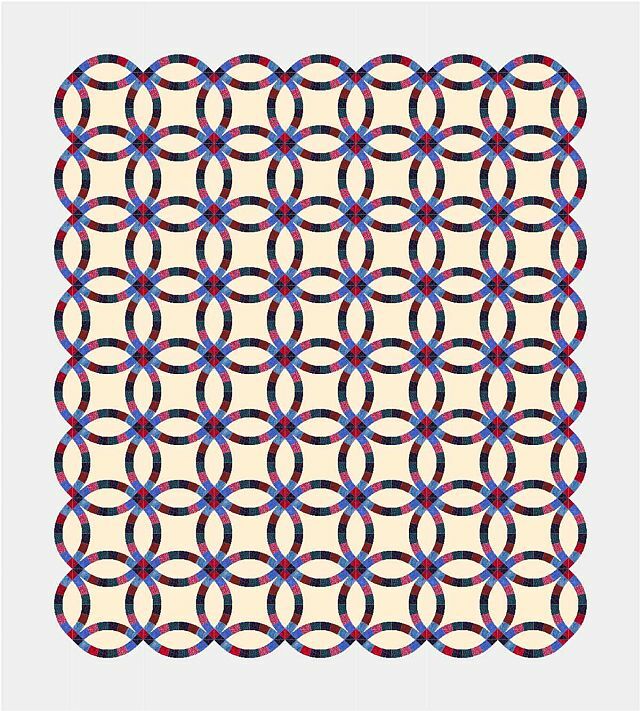 There are 30 rings – well edges of rings – on this quilt. My goal is to stitch at least one down each day. At this rate I’ll finish the binding by the end of the month. I really hoped that I would be able to show that the binding was attached to the DWR and I was stitching it down. But instead of working on the DWR last night I spent the evening assembling a grill — and it’s not done either! True, I could have bought the grill already assembled, but then I wouldn’t have been able to get it home. Needless to say, if I don’t get it into gear today, we won’t be grilling tonight either. But back to the DWR. Part of my hesitation on the binding was deciding how wide to cut the binding, determining how much binding I needed and then deciding if I had enough fabric left. There’s no getting more of this fabric — I bought it in September or October of 1989. Well, the good news is I had a yard. Ok, I’ve got enough fabric. Next I measured around the edge of the rings: 13-1/2″. 30 rings – 405″+ need extra for seams. I then pulled a piece of the leftover binding from the placemats to check the width. I basted it to the quilt and decided with width was good. That means I need 2-1/4″ binding. 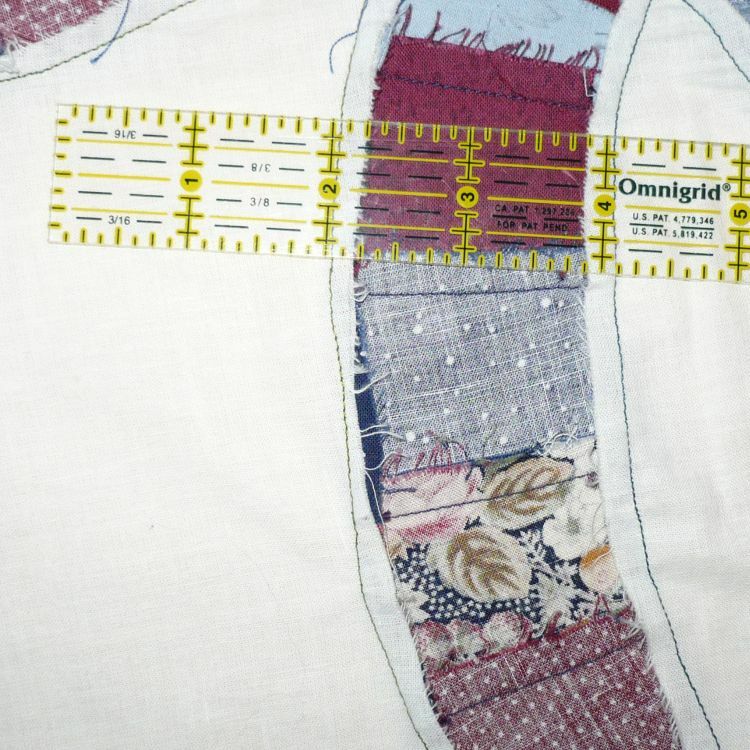 According to to the chart over at Generations Quilt Patterns 3/4 yards of 40″ wide fabric (after selvedges are removed) will yield 449″ of binding which should be more than enough — especially since I have 43″ of usable width. After I finish the grill, I’ll resume working on the binding for the DWR. 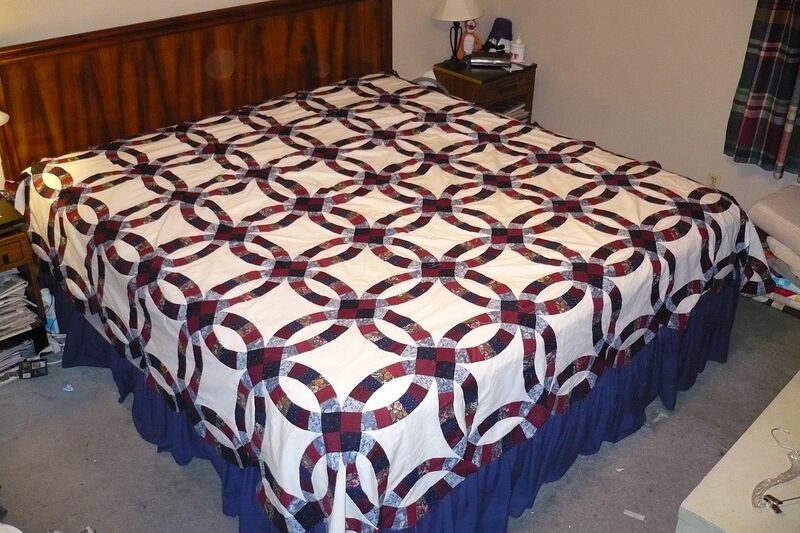 25 years is long enough for a quilt to be a UFO. It’s good that I recap what I accomplish each month or I would think I get nothing done. Much of July was spent working in the yard and or reading. But then I realize I really did get a few things done. As part of the yard work, I repainted our windmill. The center of Eeyore was quilted. A set of placemats and coasters was made. 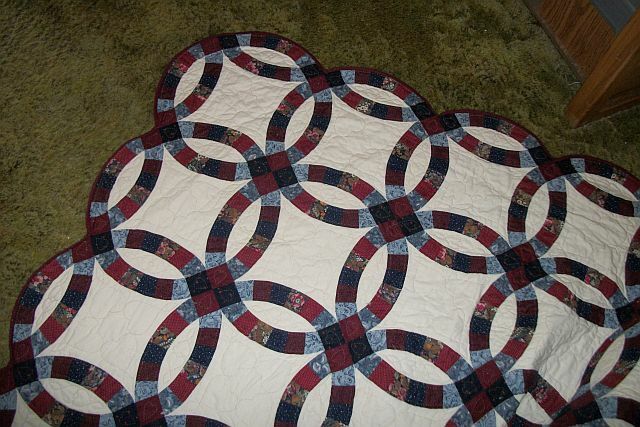 I finished quilting the Double Wedding Ring. I made the June BOM block and started on the July block, although I forgot to use muslin as my light. I did some of the embroidery on the next to last block of the Christmas BOM. Not pictured, on the 1st, I finished “the forgotten quilt”. So, what do I have planned for August? Clean up the sewing room — it’s gotten deep. There are other things which need to be done as well – labels and pillowcases for at least 5 quilts; get Scrappy Trips done – I still need to make the backing; start the quilt I’m making for a friend’s church auction and possibly quilt, bind and label another quilt for a gift if I can arrange time on the long arm at the end of the month. And of course this short list doesn’t put a dent in my 2014 Goals which is a just a small subset of my master UFO list. These weren’t the last, but toward the end. My husband made them. He wasn’t too keen on the idea, but knew it was important to me, so he did a few stitches. That stitch which I’m pointing to is the last stitch. Now to trim the quilt and get the bias binding made. I do hope I have enough fabric. Anyone know how to calculate the length of binding needed for a scalloped edge quilt? 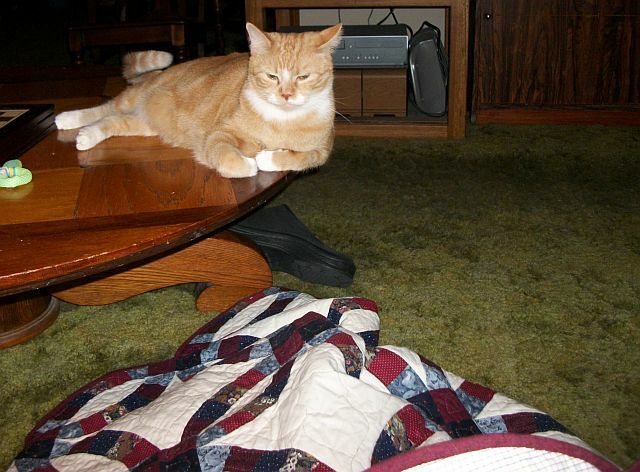 Once I get the quilt trimmed, I’ll see about getting a picture of it.